Welcome to the Young Professionals Committee Page! 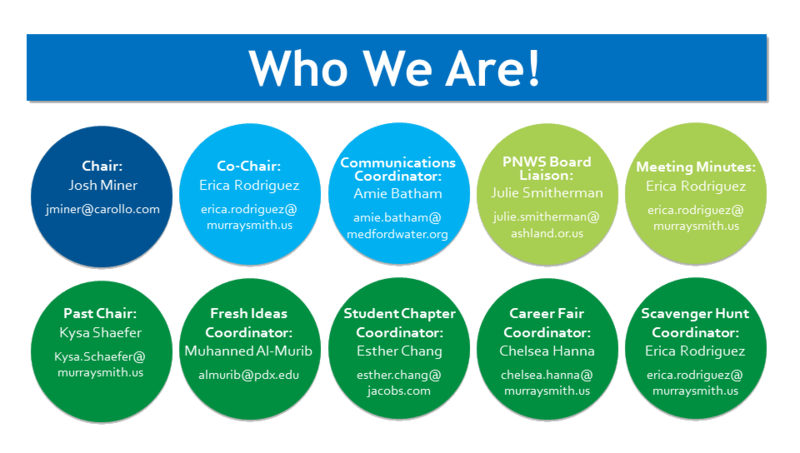 The PNWS AWWA YP Committee strives to get new and young professionals connected with volunteer opportunities within AWWA so they can discover the professional advantages that involvement in AWWA has to offer. The YP Committee consists of new and young professionals in the drinking water industry. The YPs include operators, water quality specialists, engineers, vendors, and any others that feel they would benefit from involvement. Generally speaking, YPs are under age 35 or have 10 years or less of experience in the water industry. Click here for our most recent YP Meeting Minutes! Everyone is aware that baby boomers are retiring at an alarming rate. This creates numerous opportunities for employees to move into managerial positions. Our new Leadership Symposium will provide the management skills needed for those seeking career advancement. Join us this year at the Yakima Convention Center in Yakima, WA. Becoming a lead or supervisor – what skills do you need to manage your peers? Submit your abstract now to be a presenter! The abstract window closes March 1, 2019. Registration for the 2019 PNWS Section Conference now open! The 2019 Section Conference, A River Runs Through It, is May 1-3, 2019 in Vancouver, Washington. Don’t miss the largest conference for water professionals in the Pacific Northwest! Click here to register or for more information! Look for us at career fairs around the Northwest! The school year is upon us, which means that the Young Professionals Committee will be tabling at a career fair near you. Career fairs are a unique opportunity to connect with students before they enter the workforce, letting them know about all of the great opportunities in the water industry. We look forward to speaking with students and faculty members all over the Pacific Northwest!